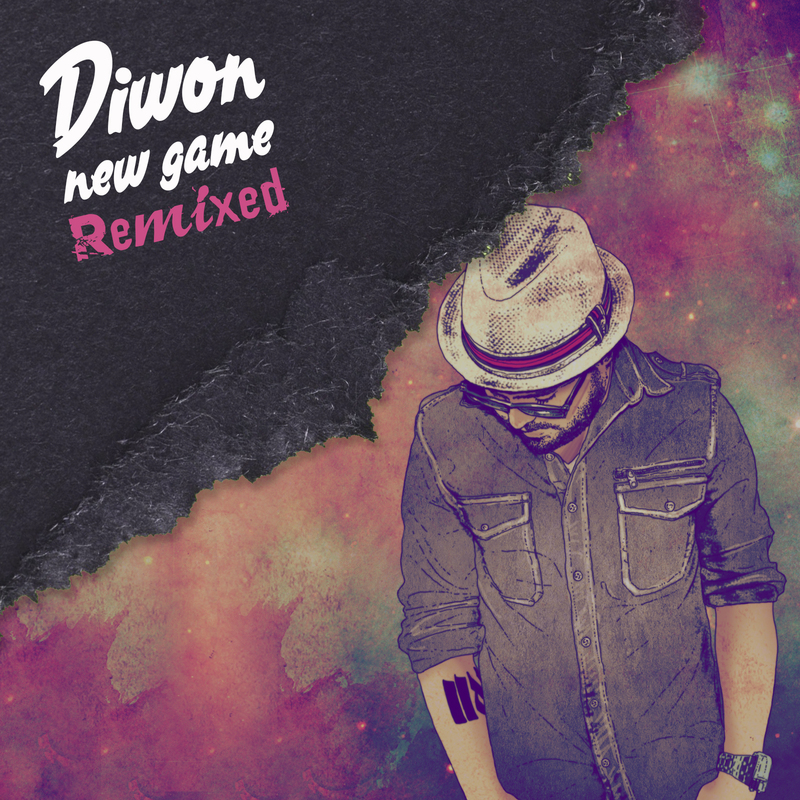 Diwon’s “New Game: Remixed”, a collection of the hottest remixes from his original LP, “New Game” hits stores January 17th, 2017. Picking 16 of the best remixes from 300 submissions, we are treated to a delicious array of sounds from Pickster One, The Last Port, Slvmber, Smoke of OldDominion, and more. This Remix LP opens with‘Games That We Play’, the first single off of “New Game” which was remixed over 400 times by producers and DJs from over 35 countries. in this remix we get treated to Thetik creating a bed of sound that matches the smooth vocals of Jesse Scott and Barney Bones. This track has a summer feel, but could make you cool off in any season. Bruzzer’s remix of “Feel You Now” takes Liza’s vocals and Diwon’s guitars and creates a pulsing universe around them, that builds into a trapped out explosionthat is unexpected, but very welcome. Meanwhile, Slvmber takes elements of ‘Feel You Now’ and sets it to an 80’s vibe that makes you want to check to make sure you are still listening to the same album. The sound is drastically different from the rest of the remixes, yet still fits in amongst the varied styles that make up the LP. Nissim kicks a mean double time flow over Naz3nt’s trippy house synths on “Try Stopping”, while Open Mike Eagle’s smooth nasal tone on the track is a statement in itself. Taary’s remix of “Been Through the Fire” pulls back on the original track of in your face guitars, and creates a soulful, laid back vibe that sets off with a fiery verse from Royal and his new west sound in the style of Tyga (an artist he produces) and the New Boyz, complete with swagged-out voice breaks. “What To Do” featuring vocals by Tim Fite, finds Thetik back in the driver seat, jumping from big synths and sweeping melodies, to stripping the track down to its bare bones, highlighting the vocal harmonies of Hannah Emerson, which are buried in the original song. Kev Frey’s remix starts with an acoustic piano setting things off before he tears up the track, chopping up the vocals, with synths and drums making the composition as playful as Fite’s witty lyrics. The elegant structure of ‘New Game: Remixed’ juxtaposes witty verses from cerebral underground rappers with polysyllabic cadences, abstract-expressionist vibes from pop and r’n’b songwriters, and a wide range of skillful instrumental styles – leaving the listener floating in an ocean of sound. People talk about hip-hop going“post-regional,” but this album is post-national. New York kicks and snares meet chopped up synths, against funky bass-lines and live guitars. This is the music you wish you heard on airplanes.